An amazing variety of Newark's great homes from the past have survived into modern times. Yet many others have disappeared. From the 18th century the Sydenham and Plume houses continue to this day as private residences. So does the rectory of the Episcopal Church's House of Prayer. Several great houses built between the end of the last century and the early years of this century display opulent ties to Newark's imposing industrial past. They include the 1871 Glencoe house on what was once High Street and is now Martin Luther King Boulevard; the 1880 mansion of William Clark on Forest Hill's Mt. Prospect Avenue; the 1889 Kublai Khan-type castle of beer baron Gottfried Krueger at High and Court streets, and the last great home built by Christian Feigenspan in the 20th century at High and Longworth streets. Each of these structures represents a nearly forgotten era in a brilliant architectural inventory of an American metropolis. The first of our 'modern' city mansions was built in 1871 for the family of James Dickerson, a prominent Newark leather manufacturer. Subsequently purchased by James Coe, a steel fabricator and hardware dealer, the house was owned by the Coe family from 1886 until 1947. The three-story building at 698 Martin Luther King Boulevard is built in three bays, sections of brick trimmed in brownstone in an Italianate-influenced style. The first floor includes an open porch with two steps leading up from the sidewalk and beveled glass doors with semi-circular transoms set into a brownstone surrounding. Large double-hung windows look out on the street on either side of the front door. The second floor exterior includes three large double-hung windows with bracketed brick lintels. The third floor has smaller rounded windows placed in groups below a heavy wooden cornice. A 1934 newspaper report described the exterior walls as 'twice as thick as today's construction and plaster twice as rich in cement, and the beams (of the house) are very heavy too. That's what has helped make the building such a substantial house for a large family.' A slate roof is crowned by a heavy balustrade, and large chimneys are part of the exterior landscape. As visitors enter the house through the double doors into the vestibule, they walk on Minton tile floors. The public rooms include a parlor on the left of 15 by 27 feet, the most elaborate room in the house with black walnut and satinwood doors so delicately balanced they can be closed with the gentle push of a finger. To the right is the 14- by 14-foot library with built-in glass-fronted bookcases, an area decorated with delicate lonic capitals. The grand dining room has four glass-fronted china cabinets. The second floor includes four bedrooms, two full bathrooms and a summer bedroom created out of a second-floor porch. The third floor hosts four bedrooms, a bath and a tower room—a semi-octagonal room with views of Newark as well as downtown New York City. It was a great place to watch the Tall Ships in 1976. A giant two-story ice box connected the basement and the former butler's pantry, now a kitchen. The basement also contains most of the building's mechanical systems. Glencoe is important because it is one of Newark's best remaining examples of an Italianate home. It also was one of the finest and first houses to be built in High Street, and remains in incredibly good condition. The Clark House served as home for its builder from 1880 until his death in 1902. It was designed by architect William Halsey Wood, who founded First Baptist Peddie Memorial Church in downtown Newark. Essentially a 60-foot-square main block building with a 40-foot by 30-foot dependency attached to the rear, the house is built of red brick on top of a stone ashlar cellar. Its proportions are grand, and it has been described as being built in the style of Queen Anne, French Provincial, or Jacobean Revival. The mansion, which occupies a full city block in the Forest Hill section between Mt. Prospect and Clifton avenues, was one of the city's and state's finest 19th century homes. Large marble columns support the front door pavilion. Inside, the house is some of the best woodwork in New Jersey. The great hall is 520 square feet and is heavily paneled with some built-in furniture. A massive carved staircase leads to the second floor off to the left, straight ahead is the family dining room. To the right is the drawing room, and in the front was probably a library. The dining room is heavily Victorian, described as 'neither pedantic nor pretentious. It is a product of good will and innocence and, consequently, (has) a charm of its own.' But the drawing room was pretentious. It was dominated by a giant ottoman, and was upholstered in damask and supporting a Chinese porcelain bowl. Wrote one historian: 'The ottoman, with the complicated gasolier above, became in effect a heavy carousel that obstructed traffic and devoured space. Heavy flowered drapes covered the stain-glass windows.' While a horror to modern taste, the room was a masterpiece for its period. Said the writer: 'The walls of the drawing-room finished in satin wood, decorated in ebony and gold are upholstered in rich, tufted silk damask of a golden glow of color to which the quiet, rich tone of the carpet is auxiliary.' After the Clarks left the mansion in 1912, it became home to the Heller family. In 1924 it was again sold and became the Prospect Hill Country Day School, whose owners fortunately kept the house in good condition until it was purchased by Stephen A. Adubato. Abubato, founder of the North Ward Center, tastefully and practically adapted the 19th century mansion to the 20th century needs of his cultural and social agency. Heavily used by its present occupant, it reflects its director's statement that 'No family should live in such a place; it should instead serve thousands.' The mansion does just that as a center for young and old, recent arrivals and long-established residents and in a variety of ways including educational, political, social and cultural purposes. The most popular, best researched, most painstakingly restored, finest decorated, and most visited historic home in Newark is the John Ballantine mansion at Washington Park, home of the former P. Ballantine company president. No longer did the Ballantines feel obligated to live next to their brewery, as was the case of the family's first generation. Two of the three sons elected to live in adjoining houses on the park. To John, the selection of his house was an outward statement of his importance in both the business and social community. 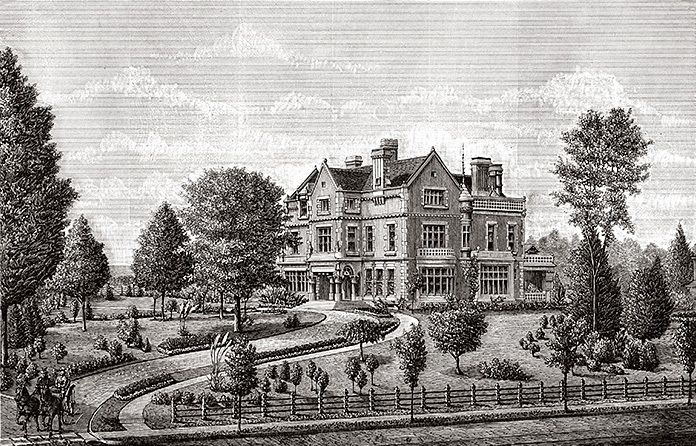 With the building of his mansion, a second generation of Newark's leading families were to soon replace the earlier Mercers, Wagners, Polhemuses, Congars, Faitoutes, Coes, Bartrams, Vanderpools, Wards and Duryeas on Washington Park. John's 17-room three-story brick house of Philadelphia pressed red brick and gray Wyoming sandstone was built in the Renaissance or Romanesque style popular in the day. The polished granite porch columns were topped with Corinthian capitals, and the roof was a modified mansard design. Inside, German and Italian workmen hand carved the mantel pieces of cherry, ash, maple and mahogany. The bulk of the interior decoration was done by D.S. Hess and Co. of New York, while most of the wainscoting was done by the Newark firm of Kirk and Jacobs. The first floor is dominated by a great central hall finished in calico-pattern oak. The reception room on the right of the front door is paneled in bird's eye or curly maple, and the walls are covered with green silk damask. The drawing room or white room is paneled with a cream color with gold leaf and the mantlepiece is of polished onyx. The dramatic scarlet library to the left of the front door is paneled in dark cherry and contains the famous Ballantine stained glass window depicting a classical maiden worshipping the sun. In Scottish, the name Ballantine translates to 'fire worshiper.' According to tradition, John Ballantine himself had a great deal to do with the creation of this window, and was somewhat disappointed when the colors were not as vibrant as he had hoped. The family dining room is mahogany paneled with a splendid mantel and the sidewalls are hung with antique leather paper sporting edges top and bottom finished with leather galloons and large antique nails. Directly across the hall is the billiards room with its small stained glass windows and beamed ceiling. The second floor had three family bedrooms, a guest room, two sitting rooms and many bathrooms. Four bedrooms were located on the top floor. After the marriage of the Ballantines' daughter, a large sitting room-library was added to the house, which now serves as the trustee room. Sixteen servants, mainly of Scottish and Irish origin, were needed to maintain the mansion, along with two chauffeurs. In 1920, the house was sold to the Commercial Casualty Insurance Co. In 1937, it became the property of The Newark Museum. Largely because of the efforts of former museum director Samuel Miller, the house was maintained and beautifully restored, making it one of New Jersey's leading tourist attractions. It is open during regular museum hours for individual or group tours. The Krueger-Scott mansion at 601 High Street was built in 1888-89 for $250,000 by Gottfried Krueger, founder of the G. Krueger Brewing Co. He also was a judge of the New Jersey Court of Errors and Appeals and was involved in many philanthropic activities. The great house that he built is now undergoing massive restoration as the Krueger-Scott Mansion, a black cultural center. Louise Scott Roundtree was associated with the building as both her home and center of her business operations, which included the Scott School of Beauty Culture among other enterprises. The architectural merits of the house are extraordinary. According to an early account 'its extremely original interior is unlike anything else in the city as an historical reminder and an architectural example, it is well worth saving.' Described in architectural circles as Baroque or High Victorian, its interior was by Herman Schultz in Empire, Louis XVI and XIV styles. A bronze-and-glass dome was at the intersection of the two main corridors. Its library was decorated in cherry and morocco and its upstairs sitting rooms were of rosewood and inlaid pearl. The dining room was bathed in embossed leather and Victorian chandeliers were found throughout the house. The house also included an elevator and a pipe organ. The exterior of the house was four and five stories, set off by a circular turreted tower. A large porch and a coachman's canopy protected visitors in bad weather. The reporter for the old Newark Sunday Call exclaimed the house 'probably far eclipses every other building of any kind in New Jersey, and was a veritable palace, such as a brewer king, born in a land of monarchs and castles might be expected to rear with his increasing wealth.' The Kruegers last occupied the house at the end of World War I. In 1925, it was sold to a construction company. The mansion was used by the Valley of Newark Scottish Rite until 1958 when it was purchased by Louise Scott Roundtree. It remained in her hands until her death, when it was taken over by the city. Shortly afterward it was vandalized but has again been taken over by Newark and has been in the process of a painstaking restoration.